It's a rainy, yet bustling, day at 640 West Community Cafe in the Historic West End of Atlanta, Georgia. Abiodun Henderson, 36, enters the locally-owned meeting place and cafe with haste, greeting neighbors with heartfelt words of affirmation in passing. "Hi, smart baby," she whispers to a plump baby bouncing on a nearby hip. "Hi, sister, how you doing? Oh, your skin is so pretty." No one is a stranger to this community organizer, activist, and founder of Gangstas to Growers, a social enterprise designed to empower at-risk and formerly incarcerated youth through agriculture, employment, and entrepreneurship. She's become an invaluable fixture in her southwest Atlanta neighborhood through her dedication to the enrichment and advancement of people of color using food security and self-reliance as her instruments of transformation. She harbored a great deal of unrest in her heart over the disparities in predominantly black, urban communities and the resulting criminalization. Born of Liberian and Trinidadian roots, her desire to defend and protect the rights of others is imbued in her makeup. She spent her formative years in Brooklyn, New York where her parents were freedom fighters - her mother in education, and her father a rank-and-file member of the Black Panther Party. After her mother's untimely death, Henderson found herself as a teenager in the Deep South, attending boarding school in Mississippi and college in New Orleans before finally settling in Atlanta. She harbored a great deal of unrest in her heart over the disparities in predominantly black, urban communities and the resulting criminalization. In 2012 the death of her father propelled Henderson to use her anguish as fuel and finally committed herself to the work. A couple of weeks after she received the news, she joined Occupy the Hood, an extension of the Occupy Wall Street protest movement. Occupy the Hood provided Henderson mentorship and the opportunity to develop comprehensive tools to tackle systemic issues still plaguing urban centers, chiefly food security. After establishing and running a community garden, as well as summer camps for at-risk youth for three years in the Westview neighborhood of Atlanta, she launched the pilot program for Gangstas to Growers in 2016. "Everything we need, I tried to put in this program," she assures. Gangstas to Growers isn't a standard work-readiness program. Instead, the mission is to genuinely and holistically improve the quality of life of each participant while reducing, if not eliminating, recidivism and crimes related to poverty. Gangstas to Growers isn't a standard work-readiness program. A typical day for the participating ten trainees starts promptly at 8AM. "We're starting either with yoga, meditation, or reflection of the previous day. And that's the way to kind of shake off everything they may have experienced at home." Trainees spend the rest of their morning learning and working on a farm within the South West Atlanta Growers Cooperative (SWAG Co-op) before completing their day in personal development classes which include political education, financial literacy, nutritional cooking, cooperative development, business management, and environmental responsibility, to name a few. Each trainee earns $12.50 per hour during the three-month program and receives job-placement with a farm within the SWAG Co-op or a local business upon completion. Henderson's hope is that these rehabilitated youths not only learn to be self-reliant in growing their own food but become contributing members of the good food movement. "We are here to support the farmers that are in the local food movement," She asserts. "We're here to also create our own products that will help boost the local economy." 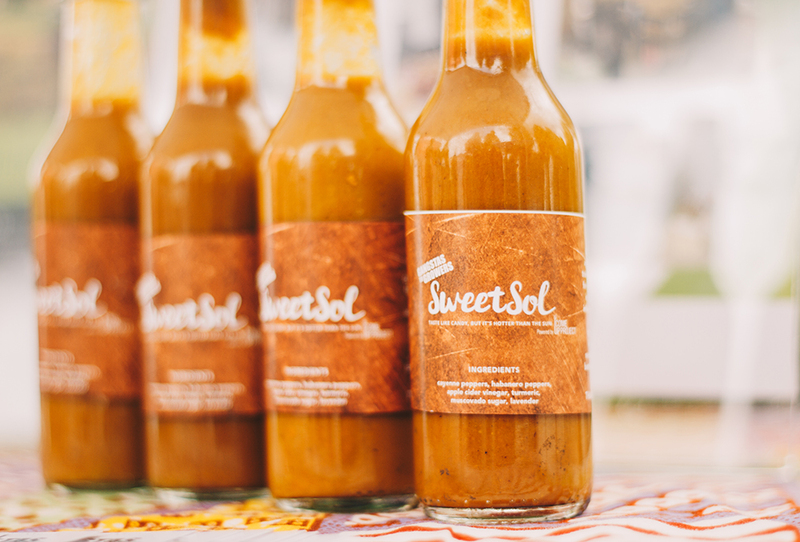 Sweet Sol Sauce, from seed to bottle, handcrafted by formerly incarcerated youth in South West Atlanta. Trainees have a unique opportunity to take the habanero and cayenne peppers they harvest themselves, along with an assortment of nutritiously-rich herbs including lavender and turmeric, and synthesize this blend into a tangible, ready-made product: Gangstas to Growers' very own Sweet Sol sauce. Henderson acknowledges how empowering it is for the young participants to have the chance to experience entrepreneurship firsthand, noting, "I harvested this. Now I'm cutting it. Now it's in a jar. Now I'm selling it and people are enjoying it. It's something for them to realize their own power." Sweet Sol is currently sold at select farmers markets around the city, as well as available in a handful of local restaurants. With the development of the hot sauce, Henderson envisions creating a worker-owned cooperative where, after completing the program, trainees have the option to become part owners of Sweet Sol hot sauce and forthcoming products. This is a critical aspect for the program to eventually become self-sustaining. Henderson lets out a deep sigh in reflection. "Just trying to create this village mentality," she says. What's undeniably evident is that she already has. Last year, Henderson was highlighted in Southern Living as one of only three metro-Atlantans named "Southerners of the Year", and the mayor's office notably included Gangstas to Growers on the list of 100 Resilient Cities Plan for Atlanta. As for the future, she smiles as she envisions Gangstas to Growers reunions down the road and countless success stories. "I want to hear how the program positively affected folks' lives. That's compensation enough." 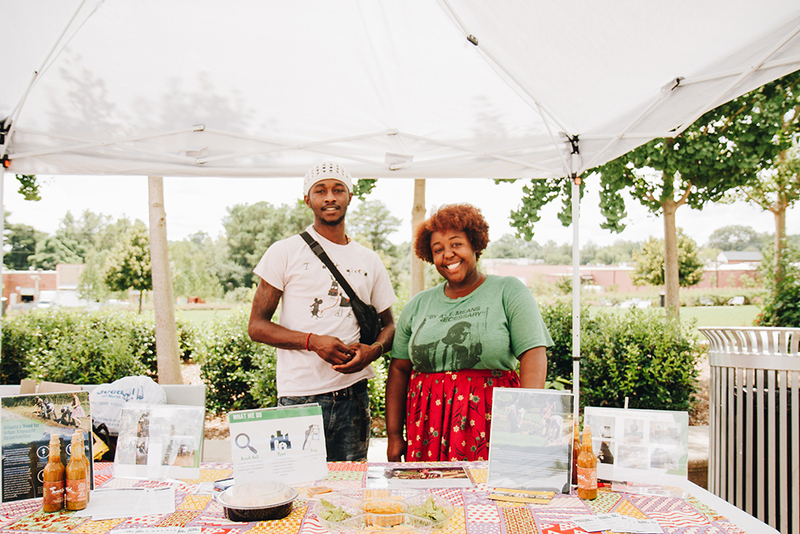 Abiodun Henderson (right) and trainee, Kwon Smith, vend at the West End Farmers Market in Atlanta, Georgia. When asked where she sees herself, she still hopes to be making an impact, even if it's just as the honorary grandmother of her neighborhood. "I would love to sit on the corner in the rocking chair with a blanket over me and just say hello to everyone all day, and love on them, give hugs. I just want to see people smile." Her unyielding love for others is felt even as she kindly checks the time and excuses herself, remembering another meeting she must get to before picking up her son from school. It's the nonstop, fulfilling life of a community organizer, and she makes sure to say goodbye to every familiar face before slipping out the door to continue the work of her ancestors, her parents, and now, her own.